In 1918, Mr. and Mrs. John P. Lowell and Dr. and Mrs. R. A. Quarles, residents of Fairhope and former members of St. James Church in St. Louis, Missouri, decided to establish an Episcopal Church in Fairhope. Meetings were held each Monday night in the Lowell’s home with The Rev. Louis Tucker, Rector of Christ Church in Mobile, leading the services. The Rev. Mr. Tucker came to Fairhope by ferry. A strong Women’s Guild was organized and through their efforts funds were raised to purchase a church building. About 1920, an abandoned Baptist Church was purchased, and with voluntary labor, the interior of the church was adapted for Episcopal services. The church was named St. James, after the church in St. Louis. The street on which the church was located was also named St. James by the city authorities. The church, debt free, was consecrated by Bishop McDowell in 1923. The Rt. Rev. Daniel S. Tuttle of St. Louis, and the Presiding Bishop of the Episcopal Church, sent $25 toward the cost of the church, saying he wanted to own a rafter in St. James Church, Fairhope. The church functioned as a mission under the supervision of Archdeacon Plummer and other clergy until 1948. St. James grew in membership as the city began to expand, and under the leadership of the Rev. Joseph Horn it received parish status in 1949. On March 17, 1953, an adjoining tract of land east of the original property was purchased for $7,000.00 and a parish hall was constructed. The church continued to grow during the ministry of The Rev. Seddon Lee, and as early as 1955, a vision for a new church was established. This vision became a reality, and construction on the new church started in the Spring of 1957. The first service was held in the new church on Thanksgiving Day, November 28, 1957. In 1956, The Rev. William R. Hill became the eighth rector of St. James Church. He retired on December 31, 1985, after 29 years of service. The Rev. Mr. Hill quietly and gently led the congregation through years of change in the community and the church, and ensured a strong Episcopal presence on the Eastern Shore. In September, 1987, The Rev. C. Gilford Green, became rector of St. James Church. Under his leadership, the church increased to about 900 members. St. James discovered itself at a crossroad, being land-locked, and having outgrown its facilities. A new building program began with the purchase of 9.5 beautiful acres of land located on a hill at the entrance to Fairhope. 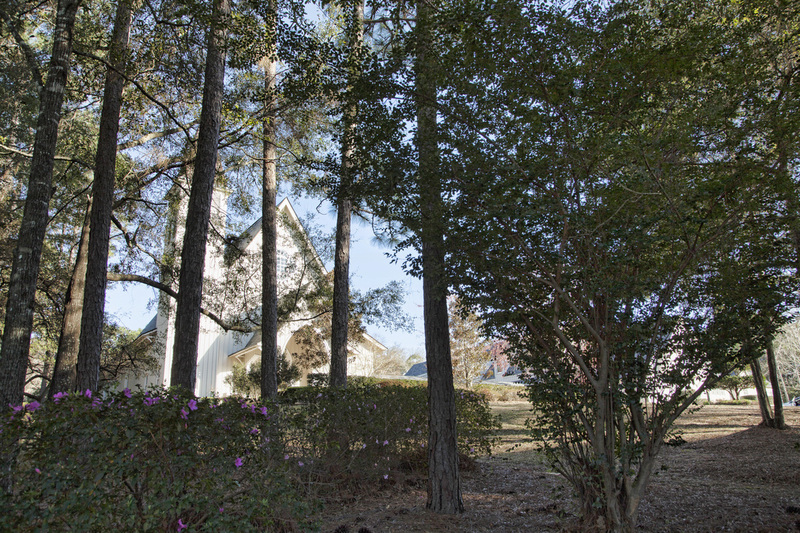 A “Gulf Coast” Gothic building was completed on the wooded lot including a 400 seat sanctuary and a 100 seat chapel. The first service in the new church was held on Easter Sunday, April 3, 1994. The architects, Errol Barron and Michael Toups, received the Honor Award of Excellence by AIA Louisiana for designing St. James Church. The Rev. M. Scott Davis was called to serve as rector of St. James in December, 1996. His ministry continued through September, 1999. In November, 2001, The Rev. Mark H. Wilson accepted the call to become the 11th rector of St. James Church. After his death in 2014, The Very Rev. Johnny Cook became the interim rector. in August 2016, The Rev. Denson Freeman became the new rector. ​The church continues to grow averaging over 400 worshipers at two services on Sunday mornings, with a third service added in September of 2017. The Christian Education building has recently been renovated to accommodate the expanding children’s and youth ministries.